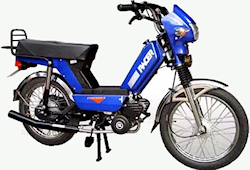 Moped Scooters - What Is a Moped Scooter? Scooters Mopeds - Huh? Moped Scooters or Scooters Mopeds? What's the Difference? Is There One? Moped scooters... Isn't that kind of an oxymoron? I mean scooters mopeds... what does that mean? I research every page I put up on this site to see what other sites are publishing related to certain keywords. I knew that thousands of people every day are searching for information on "moped scooters", "moped scooter" and "scooters mopeds", so I wanted to know what they were finding when they did so. What I found is that most sites seem to be using the terms moped and scooters in combination to basically mean motor scooters or gas scooters. But that's not quite right. In fact, scooters and mopeds are really 2 different entities, just as motorcycles and scooters are. So, I did my homework to find out more about official definitions and I found that both Wikipedia (the Web encyclopedia) and the Idaho Department of Transportation spell out the differences pretty clearly. 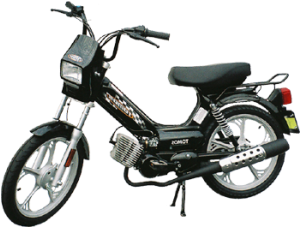 The term moped comes originally from a Swedish journalist as a shortened combination of motor and pedal. And that dual designation describes that most mopeds can be both motor-powered and pedal-powered. To my eyes, a true moped looks a lot like a bicycle with a motor. Depending on where you live, there may be other legal definitions for a moped in your area. Moped owners are sometimes privileged to not have to be licensed, although that's not true in Idaho, where I live. And not every moped can be considered street legal either. Sometimes, especially the electric mopeds, they are little more than kids' toys that can only be ridden on private property. Definitions in some countries, and even some states within the US, may blur the lines between scooters and mopeds to the point where the term moped scooters actually makes sense... at least to them! As for me, I'll continue to think of them as 2 different things... but you can do as you like.